Chronic urticaria (CU) also known as hives, is a common disease in which at least 50% of cases are considered to be idiopathic. 20-40% of patients with CU may have autoimmune urticaria. One form of recognized autoimmune urticaria consists of the development of antibodies against the IgE receptor that can cause urticaria via histamine release. However, autoimmune urticaria might also signal the possibility of other autoimmune conditions. This study collected data on 12,778 patients given a diagnosis of CU by either allergy or dermatology specialists during 17 years in a large health maintenance organization. These conditions were mostly diagnosed during the 10 years after the diagnosis of CU. This study suggests that chronic urticaria might be the first manifestation of an autoimmune disease. However, it is important to understand that not all patients with chronic urticaria will develop autoimmune disease. For majority, urticaria might be all there is. If you have urticaria/hives lasting for more than 6 weeks, an Allergist can help. Dermographism means “write on skin” and it is the most common form of physical urticaria in the population. It is estimated that 4-5% of the population are affected. This condition is quite benign, and the patient should be reassured upon diagnosis. It is not known what exactly causes this condition, and it may last several months to years before going away. Treatment includes antihistamines and avoidance of physical stimulus of the skin that can cause the urticaria. The person should also be instructed to avoid hot showers/baths as it tends to make the condition worse. Dermographism can also be associated with chronic urticaria (generalized hives that has been going on for more than 6 weeks). A qualified Allergy & Immunology specialist can help evaluate your urticaria/hives. Hives is also known as urticaria. A hive or urticarial lesion is an itchy raised wheal that resembles a mosquito bite. An urticarial lesion usually appears suddenly. 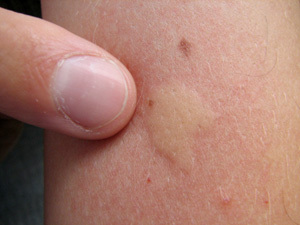 Each lesion generally lasts for a few hours and fades without leaving a mark. Generally urticaria is divided into acute urticaria or chronic urticaria. Chronic urticaria is defined as hives that has been going on for more than 6 weeks. The causes of urticaria depends on whether the urticaria is defined as acute or chronic. 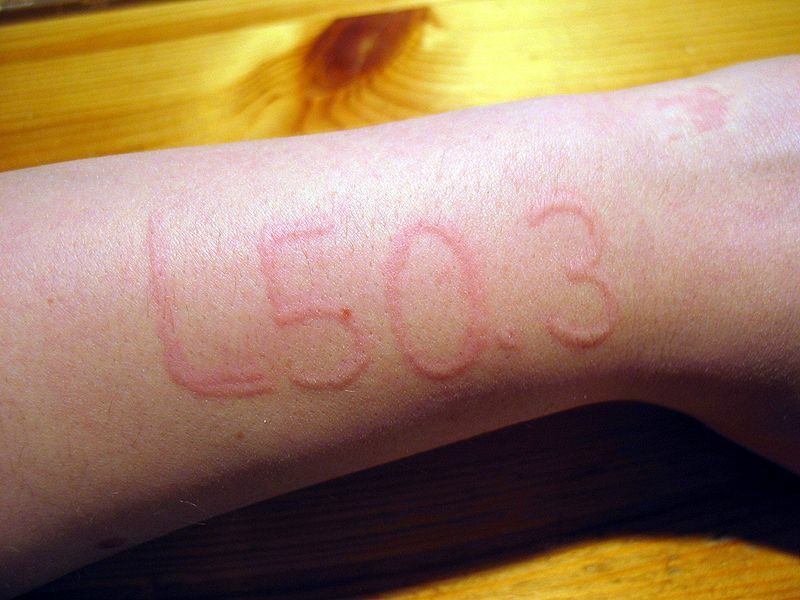 In children, acute urticaria is usually associated with infections and food allergy. In adults, acute urticaria is usually associated with medications. The cause of chronic urticaria is usually more challenging to determine and difficult to pinpoint. If you suffer from urticaria/hives, a qualified Allergy & Immunology specialist can help evaluate and treat your condition.